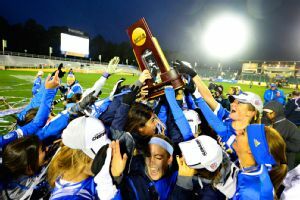 CARY, N.C. -- Kodi Lavrusky gave UCLA its first NCAA women's soccer title Sunday, scoring in the 97th minute to lift the Bruins past Florida State 1-0 in overtime in cold and rainy conditions. "The whole game we knew we had it in us," Lavrusky said. "Once we got to that first overtime, we knew our chances were coming. We just had to finish one." Making a run from the back, Megan Oyster brought the ball down the left side of the field before crossing over to the middle. She slipped a pass in front of the goal to Lavrusky, who left-footed the ball into the bottom right corner of the net past diving goalkeeper Kelsey Wys. It was the first title game decided in overtime since 2002. "Honestly, I just took my chances," Oyster said. "I knew we were going to get one eventually. I just stayed composed, and it was probably the best pass of my life. I've never done that before. I guess it was a good time to do that." UCLA was winless in three previous appearances in the championship game, all since 2000. The Bruins (22-1-3) finished the season with a 21-game unbeaten streak. They had 15 shutouts during that span, including five of six matches in the NCAA tournament. UCLA beat the past two national champions on its way to the crown, a record 110th NCAA team championship for the school. The Bruins won their last three games against teams from the Atlantic Coast Conference, which placed six teams in the quarterfinal round and three in the College Cup. UCLA holds up the NCAA Championship trophy after deteating Florida State 1-0 in overtime on Sunday. "I think if you look back, it might be one of the best runs ever," first-year UCLA coach Amanda Cromwell said. "It really might be. This team is phenomenal. The amount of talent we have, and what we brought forth throughout that run was the mentality and the resolve. I think the toughness of those games brought us to this point. I knew these girls were destined to win it." Wys made seven saves for Florida State (23-2-3), which had its nine-game winning streak snapped. The Seminoles were making their third consecutive appearance in the College Cup. "Going through the season and being successful has been great," Florida State senior defender Kassey Kallman said. "But this was our third year back, and we're not satisfied with losing in the championship. I wish the best of luck to them next year and hope that they get it done then." UCLA outshot Florida State 15-5 in regulation and controlled the run of play in each half. Taylor Smith had the best two chances at a goal for the Bruins in regulation. She blasted a shot off the crossbar in the 30th minute and hit the left post just before halftime. The second opportunity was especially dangerous. Caprice Dydasco blasted a shot that Wys saved. After a failed clearance attempt by Florida State, the rebound ended up at Smith's feet. She had the left side of the net open from about 12 yards away, but her left-footed shot hit the frame. The Bruins kept the pressure on throughout, outshooting the Seminoles 12-3 after halftime. "Often times if you're not controlling the tempo of the game and having more of the ball, you're looking for that moment for a big chance," Florida State coach Mark Krikorian said. "We had a couple of half chances or partial chances or whatever that with a little bit more luck, it turns in our direction. But overall, it wasn't meant to be." The temperature on the rain-soaked field was 35 degrees when the game began, more than 40 degrees colder than the high temperature Friday for the semifinals. Players opted for various combinations of long sleeves, gloves and headbands in the cold rain. "The weather and the conditions were the same for both teams," Kallman said. "I didn't think it was too bad around the field. We were able to play. It wasn't like we were slipping all over the place. "